From Israel to Florida, to the Moon. 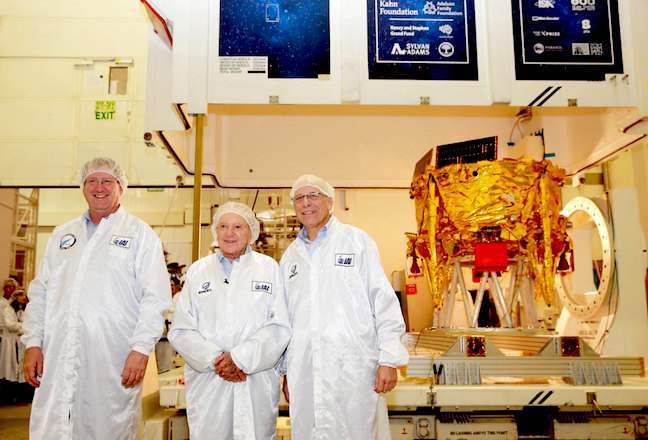 “After eight years of hard work, our dream has come true: We finally have a spacecraft,” said SpaceIL CEO Ido Anteby. “Shipping the spacecraft to the United States is the first stage of a complicated and historic journey to the moon." The task of landing an Israeli spacecraft on the moon has become a national project, with educational impact, funded mainly by Morris Kahn, a philanthropist and businessman who took the lead in completing the mission, serving as SpaceIL’s president and financing $40 million. 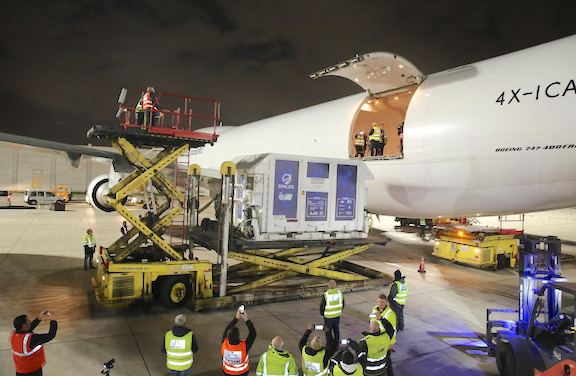 The Israeli nonprofit SpaceIL and Israel Aerospace Industries (IAI)’s first lunar spacecraft began a historic journey to the moon as the vehicle was transported in a cargo plane from Ben Gurion Airport to Orlando, Florida, was it prepares for launching from SpaceX Launch Complex 40 (SLC-40) at Cape Canaveral Air Force Station next month. SpaceIL and IAI recently packed the 180-kilogram spacecraft into a special temperature-controlled, sterile shipping container, built to protect the spacecraft and ensure it arrives safely at the launch site. After landing at Orlando International Airport, the spacecraft, named Beresheet (the Hebrew word for in the beginning), will then be driven to Cape Canaveral Air Force Station, where it will be added as a secondary payload by launch service provider Spaceflight. It will be launched on a SpaceX Falcon 9 rocket together with a geostationary communications satellite built by SSL. The launch is targeted for no earlier than mid-February. 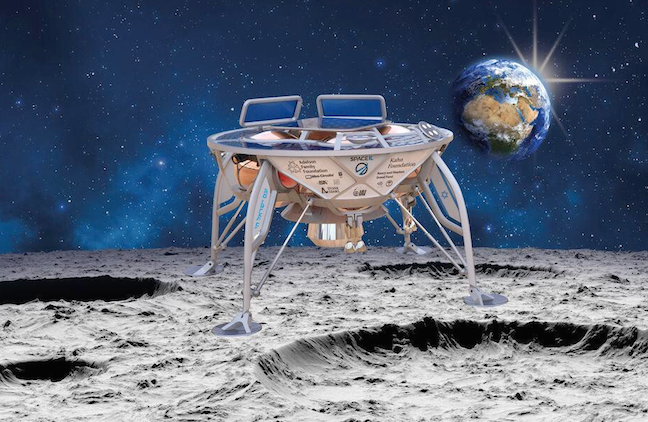 Upon completing its lunar mission ­– the first in Israel’s history and the first that’s privately funded – Israel would join superpowers China, Russia and the United States in landing a spacecraft on the moon. "The excitement we all feel today will only intensify moving forward, and I can't wait for the next milestone,” said Kahn. “This is only the beginning." The process of planning and developing the spacecraft, which includes the intensive work of engineers, scientists and staff, began in 2013 and continued until last year. The spacecraft, which weighs only 600 kilograms, is considered the smallest to land on the moon. It is only 1.5 meters wide and will be carrying about 75 percent of its weight. Its maximum speed will exceed 10 kilometers per second (36,000 km / h). Once launched, the spacecraft will begin with a long and complex flight. The spacecraft will be deployed from the SpaceX Falcon 9 rocket when it reaches approximately 60,000 kilometers from Earth’s surface and begin orbiting the Earth in elliptic orbits. It will circle Earth, widening its circumference each time, while saving fuel and only starting the engines at the end of each cycle. Then, at the right time, it will leave Earth’s gravity and enter the gravity of the moon. After circling the moon a few times, it will begin the landing process, carried out autonomously by the spacecraft's navigation control system. The entire flight, from launch through landing, will take about two months. Once the spacecraft, carrying the Israeli flag, lands on the moon in April 2019, it will begin taking photos of the landing site. It will also perform measurements of the magnetic field in a scientific experiment carried out in cooperation with the Weizmann Institute and NASA. The data collected from this experiment will be transferred to IAI's control room during the two days following the landing.